...the railroad came to the shanty-town of Deadwood. Its folk have noticed an influx of settlers coming into town, but these ain’t tourists. You and your gang are looking to call Deadwood home; with the railroad comes cold, hard cash. But you don’t mean to share any money with other arriving gangs. As a cowboy on the wrong side of the law you know just the solution: threaten, fight, and kill off your rivals. Prepare to enter a world where the quickest way to solve your problems is with a bullet. Deadwood is a wild and wooly board game for 2-5 players with a quick and deadly twist on classic worker placement games. Control a gang of cowboys, using them to take control of Deadwood’s businesses, and collect as much money as they can. The player with the most cash at the end of the game is the winner...if you’re not dead first. In the reckless and exciting game of Deadwood, there’s no room to be cowardly if you’re looking to cash in. 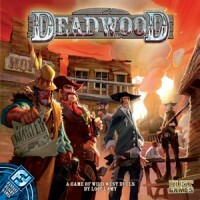 The Goal of the game: The players begin with a gang of gunslingers, cowboys and their send into the town of Deadwood to “annex” the businesses and collect the money much as they can. The player with the most cash at the end of the game is the winner. Your gang consists of three different classes of cowboys with different strengths: greenhorns, gunslingers, and trail bosses. Cowboys ride into town to gain control of (“annex”) buildings and fight other gangs’ cowboys in shootouts (made by rolling dice). A board game simple and fast to be explained. It takes less than 10 minutes to explain all the rules. Even a child easily learn the rules. It’s a great game to be played especially when you are with a mental fatigue after play another game with a great time consuming and difficult to play. Or, if you and some friends are waiting a guy behind to complete the group to playing another game. Valid for this game take into parks and excursions that you have about 40 minutes of free time with the gang. 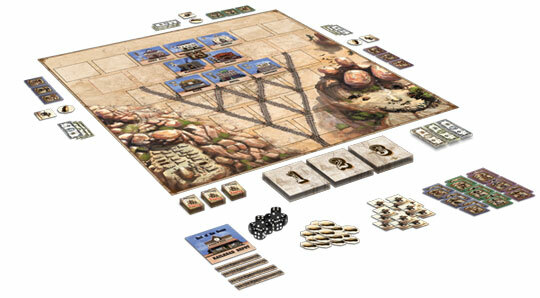 The tiles are made of durable material and well made, the proper standard of FantasyFlightgames. The game gives for 2-5 persons (4 persons recommended for greater dynamism in shootouts). Playing time 20-60 min, when already known rules is practically impossible with five people spending 50 minutes of play. The Family Gamer – 5/5 – Good for kids to play with their parents. The Social Gamer – 5/5 – Good for you to shoot with his cowboy buddy and make fun of anyone who flees a duel. The Strategy Gamer – 2/5 – There are few strategies in this game, if you like complex games, find another. The Casual Gamer – 5/5 people to expect or when it is in a short time and 3/5 if you’re only with this game (after about 3 to 4 times then played, the game loses a bit of grace). The Avid Gamer – 4/5 – Good for calling acquaintances of view and an “ice breaking”. Good for strangers become friends in the future. The Power Gamer – 3/5 – You will like this game the first three times you play. Think of it as a “secondary game”, do not get too stressed out with simple rules and rolling dice. – Great game side, great to “break the ice” if you do not know all the people at the table. – If you have reserved for a whole afternoon playing board games not only take this game to play. In my opinion a great western game to spend time with friends. Add a Review for "Deadwood"